Our favorite pickles are the kind you get from a barrel on New York's Lower East Side. Those snappy, crunchy full and half sour pickles owe their signature pucker to lacto-fermentation, the same process behind kimchi, kraut, and so many of our other favorite ferments. Luckily, you don't need a giant wooden barrel to recreate these classics at home. And while having one of those giant wooden barrels (and the kitchen to fit it) from which to dramatically pluck our homemade pickles would be awesome, we're happy to pull them from our compact glass fermenting jars instead. 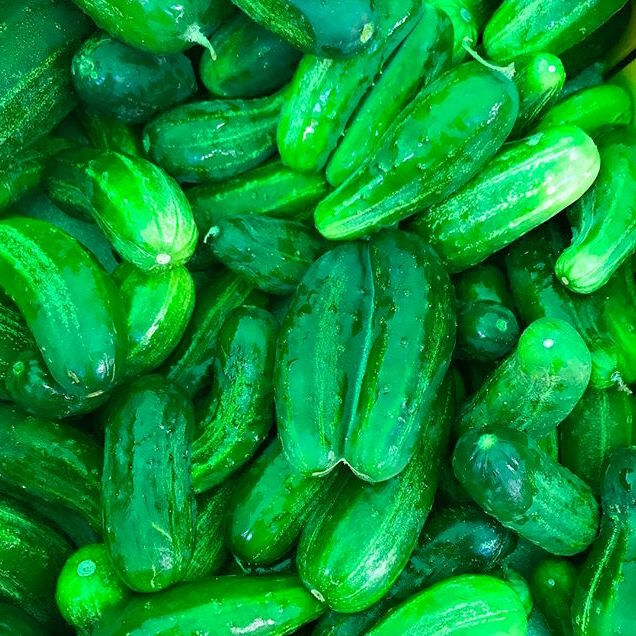 To make the snappiest, crunchiest pickles in your kitchen (no matter where it is), be sure to start with super fresh, firm kirby cucumbers from the farmer's market. Adding tannins to the fermenter helps ensure a crispy snap. We use black tea leaves since we're not fermenting in a big oak barrel. Fresh dill and crushed garlic round out the flavor of these classics. One bite of your homemade batch and you'll be transported to the Lower East Side. No need to run to the deli or book a ticket to New York to get your pickle fix! Wash and trim blossom side of cucumbers. Chill in ice bath for 20 minutes. Dissolve 2 tablespoons salt in 1 quart of water to make the brine. Pack cucumbers, tea bag, dill, and garlic into fermentation jar. Pour brine over to cover. Add fermentation weight. You want the packed cucumbers to be completely submerged when weighted. Questions about fermentation weights? Check out our Fermentation Weight Guide. Top with lid and airlock (Need help? Check out our How to Assemble Airlock Video). Let ferment for 3 days at room temperature out of direct sunlight, brine will turn from clear to cloudy. Taste pickles after 3 days. If you want them to be more sour, leave for another 1-2 days before moving to the fridge. Pickles are ready to eat immediately, but we like them even more after a week and will keep refrigerated for at least 2 months. The easiest way to make lacto-fermented pickles at home. Your favorite kinds of pickles—from deli-style full sours and half sours, to classic dills and fiery hot pickles—all get their signature snappy crunch and tart pucker not from vinegar, but from fermentation. Specifically lacto-fermentation.